How To Make Mushroom Tea? Enjoy the Health Benefits of Mushroom Tea! The practice of making infusions or “tea” from mushrooms for medicinal purposes has existed in many Eastern cultures for thousands of years. It is now catching on with health enthusiasts here in the United Sates and appearing in many natural and health food stores. Before learning how to make mushroom tea, it is important to understand what it is. Although mushroom tea can be made with any edible mushroom, most mushroom teas focus on four primary types of mushrooms. • Reishi mushrooms are the most prized for making mushroom tea. The naturally occurring chemicals in the mushroom are believed to help balance hormones, reduce stress, and even help the body break down the stress hormone cortisol. Reishi mushrooms are native to Japan, Korea, and China and grow in oaks, maples, elms, and other hardwoods. It is unusual to find these mushrooms growing in the wild, so the majority of the ones sold today are commercially cultivated. • Chaga mushrooms are high in antioxidants and have immunity-boosting properties. Chaga mushrooms are unusual and somewhat scary in appearance. They are a hard, black, crusty fungus that look like a tumor forcing its way through the trunk of the tree. Chaga are most common on birch trees, but they can also be found in chestnut, alder, and hornbeam trees. While the chaga has medicinal properties in humans, they will eventually kill the host tree, which is why they are sometimes referred to as tree cancer. • Cordyceps mushrooms are believed to improve oxygen intake, which can increase exercise endurance. The cordyceps mushroom is perhaps the most fascinating because of the way that it reproduces. The spores infect insect larvae that live underground and eventually kill and mummify the larvae. The fruiting portion of the fungus then pushes its way above ground. The resulting mushroom looks more like a curved cane or finger than a traditional mushroom with a cap and stalk. • Turkey tail mushrooms have been used for medicinal purposes since 200 B.C. They are believed increase vitality, promote healthy liver function, and increase bone and muscle strength. The mushroom gets its name from its shape and color variations that resemble the tail of a wild turkey. Turkey tail mushrooms are currently being tested on cancer patients as a way to lessen the side effects of chemotherapy. To make tea, the mushrooms are dried and then ground into small pieces for brewing. Pre-packaged versions are also available where the active ingredients come in a powdered form in a bag or a packet like sugar. You simply add the powder to your morning smoothie, coffee, or dissolve it in hot water. The resulting brew is brown, opaque, and vaguely resembles coffee. Some may find the flavor an acquired taste; however, you can create something similar to weak black tea or miso soup by adding herbs or other ingredients. 4 to 5 cups of water. Start by breaking or grinding your mushrooms into small pieces. Smaller pieces will yield a better extraction. Bring your water to a boil using a ceramic or stainless pot. Once the water is boiling, add your mushroom pieces, and reduce the heat to a simmer. After 2 hours, remove the tea from the heat, strain, and allow it to cool. If you find the tea too bitter, you can add green tea, ginger, honey, or even juice. Your tea will last several days when stored in your refrigerator. For a chaga mushroom tea, add a large chunk of chaga mushroom to 4 cups of cold water. Bring the water to a rapid boil. Reduce the heat, and allow the mixture to simmer for 20 minutes to 4 hours depending on how strong you like your tea. To serve, add honey and milk. With a few simple additions, you can end up with a “tea” that is more akin to a savory broth, which can help make the brew more palatable. Start with water and mushrooms as mentioned above. When you add your mushrooms, also add a 3-inch piece of ginger and several sprigs each of mint, thyme, and dill. You can also add a couple of slices of jalapeno if you like things a little spicy. Once the mixture has simmered, remove the solids. You can drink the tea warm like a broth or allow it to cool. 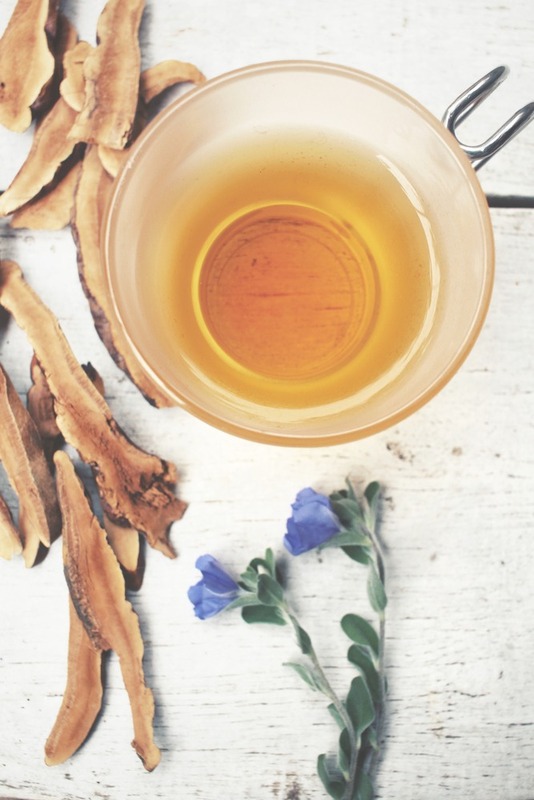 It is important to note that mushroom tea can potentially interact with certain medications, including blood pressure medications and anticoagulants. If you take medications on a regular basis or have chronic health conditions, you should consult your doctor to make sure that mushroom tea is appropriate for you. 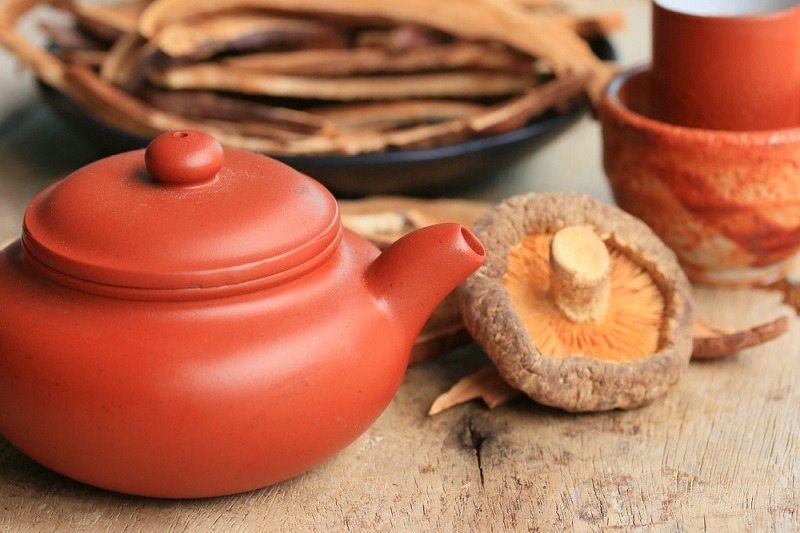 In rare cases, mushroom tea can cause allergic reactions or stomach upset. It is best to start with a small amount at first to make sure that you do not have an adverse reaction.